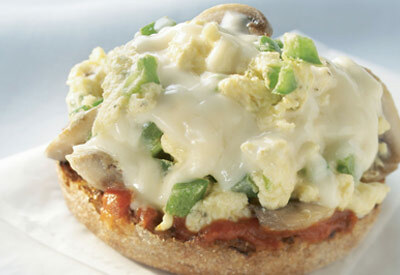 Warm up with this cheesy breakfast pizza delight! Split English muffin in half and toast; set aside. Heat small non-stick skillet over medium heat. Add mushrooms, green onions and bell pepper. Cook, stirring continuously for two minutes or until vegetables are softened. Stir egg substitute, black pepper and oregano into vegetable mixture. Cook, stirring continuously until egg substitute is set, about two minutes. Spread 2 teaspoons of pizza sauce onto each English muffin half. Spoon a quarter of the egg mixture over pizza sauce and top with a quarter of the cheese. Spoon the remaining egg mixture and cheese evenly on top of the muffins. Place the muffins on a baking sheet and bake for five minutes, or until cheese is melted.